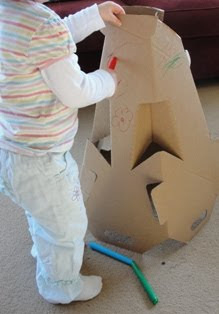 Sun Hats & Wellie Boots: When is a box not a box... when it's a Teepee! When is a box not a box... when it's a Teepee! I was lucky enough to have a beautiful arrangement of flowers sent to me for my birthday. The flowers were stunning, but being a craft loving mum & a fan of recycling, I couldn't help getting excited about the box they came in! When Minnie saw the box she immediately grabbed her colouring pens & pencils & set to work decorating the box. She then wrapped it around herself like a blanket. 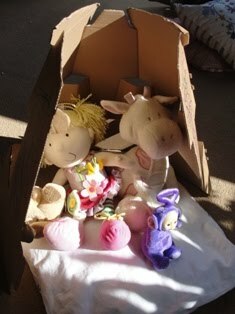 We talked about the texture & feel of the box, & decided a blanket was a softer, cuddlier option instead of the cardboard. So still following the theme of wrapping the box around her, I suggested we turn the box into a teepee! Much fun was had in the new house, & all the visitors (toys) checking out the new residence were impressed too! Snack time & a picnic lunch were enjoyed in the teepee & a number of additions added, e.g. cushions, a window, & of course a soft, cuddly blanket. The teepee has since been painted & turned into a rocket! If it survives I wonder what it will become next? ?